This post contains affiliate links. See my disclosure page for more information. The holidays are fast approaching! Sometimes you just don’t know what to get that special lady in your life, especially if that lady happens to be into preparedness, like you! Sure, the lady prepper is still a lady…. but that doesn’t necessarily means that jewelry is the best gift. In fact, I’d venture a guess that most of us lady preppers would rather have anything else! (1)You know what says lady prepper best? 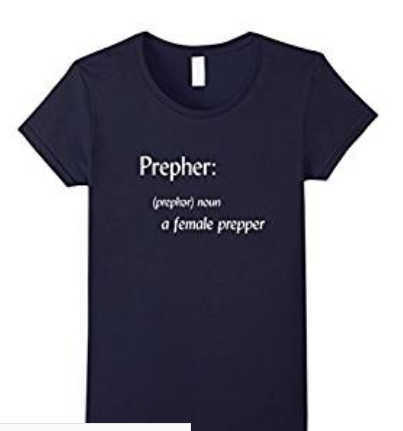 A prepper t-shirt designed for the female prepper, yes, a PREPHER !!! and it’s available in ever popular black, brown and navy. (2)If you’ve ever tried to dehydrate in the oven, the back of the car (yes, it’s a thing) or a cheapee unit, you’ll know that you need quality equipment. I own one of these Excalibur dehydrators. It’s big enough to do a lot of food at once and because it has a fan inside, the food dehydrates more evenly. It’s a must for a prepper. (3)A modern yet old fashioned style butter churn? Yes Sir! Who wouldn’t want a butter churn like Grandma (or Great Grandmother) had? Clear glass so you can see the butter making… old fashioned wood handle, plastic paddles for ease of cleanup. Kilner’s been making these since 1840! Sure, your lady already carries a purse everyday but you know that, even though you think it does, it can’t hold everything. Every lady needs a bug out bag (that isn’t bright pink or neon) to keep in a desk drawer at work and/or her vehicle. You just never know. That’s what being prepared is all about. Put this little self defense spray in your ladies stocking and she’ll know you love her. Nothing says love like protection. This little portable power pack can sure come in handy. Sure, you might ‘know’ how to jump a car battery…. but assuming you aren’t around to help, do you want your lady asking just anyone for a jump? With a power back you can start your vehicle, or your cell phone! Sure, most of the time I can tell which way is north. But what if you got turned around and it was foggy… in the country where there are no street signs or identifiable markers or cell coverage? (These places do exist!!) This one’s pretty to boot! Some folks confuse a pressure canner with a pressure cooker. There is a difference. You can pressure cook food in the cooker but you can’t can in it. To safely put food by in mason jars you need a real pressure canner. Personally, I’d go as big as you can afford. You’ll outgrow a small model. No wasted space because if you’re only processing a small batch you can always can water for long-term use! This one’s on my personal wish list. Often times you see ‘down alternative’ comforters and/or down comforters that only have a small percentage of actual goose down in them. Well let me tell you that you haven’t slept wintertime warm until you’ve slept under a real goose-down comforter! There is just no comparison. I’ve a favorite and I have several on hand for ‘just in case guests’. Love them. If it wasn’t hot on a deserted island… a goose-down comforter would be on my ‘must-have’ list. I hope some of these suggestions hit the mark for you (AND) the lady prepper on your Christmas gift list. Still overwhelmed? Consider gifting her an Amazon gift card and let her choose her own gift!